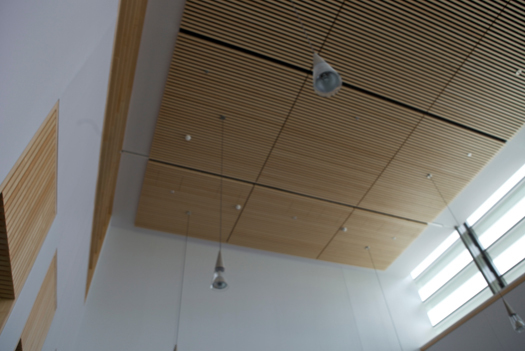 In this project, there is a three-floor atrium that is categorized as a two-floor atrium with a communicating space separated by a one-hour fire protective curtain. The two-floor rule applies, which is 404.5 exception 6 that no active smoke control is required for a two-floor atrium. Fire Protection Engineers with the authority having jurisdiction are able to remove all active smoke extraction systems since the curtain is UL certified (see UL On-Line Certification Directory) for one hour. 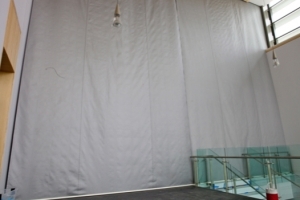 The curtain deploys by gravity and maintains tenable conditions for the egress corridors during the evacuation sequence. Provide an extraction system- this is not gravity fail-safe. Is four times the cost of curtain technology and increases life cycle cost. Provide a Glass Block wall- not possible since it needs to be open for the monumental stairway in non-alert times. Fire Shutter- No space in floating ceiling for this. The curtain is a housing of 12 inches for a 30-foot drop height and weighs only 10 pounds a linear foot.